I love monthly subscription boxes and I love them even more when they contain lots of sweets! Scoff Box post out a box full of yummy treats for £12.99 a month and I had so much fun 'testing' it out! Similar to companies like Birchbox where you can buy just one box as a little treat for yourself or a friend, or subscribe and get a box delivered to your door every month. The box is so much bigger than I thought and is packed with sweets which will last you quite a long time so you definitely get your money's worth. 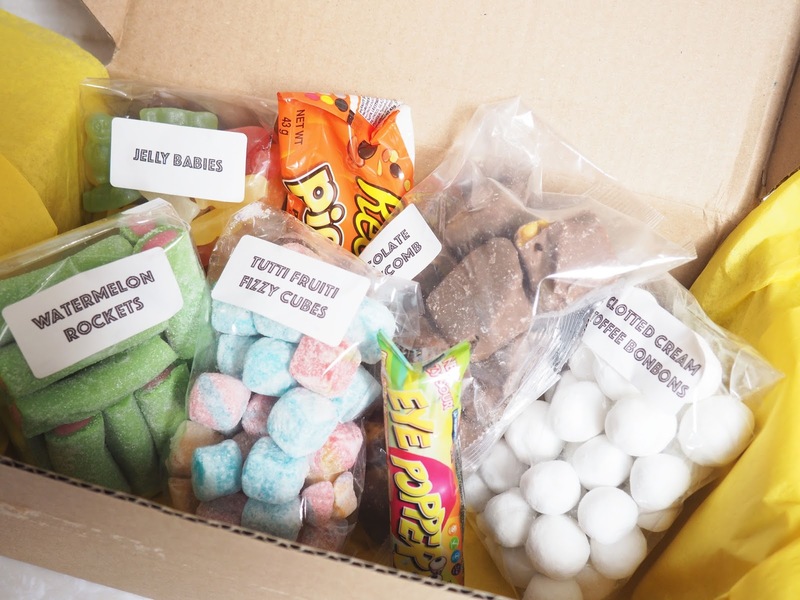 In this box I recieved Watermelon Rockets, Tutti Fruiti Fizzy Cubes, Eye Poppers, Clotted Cream Toffee Bon Bons, Chocolate Honeycomb, Reece's Pieces and Jelly Babies! I was so excited to get the Watermelon Rockets in this box as watermelon flavoured sweets are my absolute favourites and the jelly babies and Bon Bons also got eaten very quickly. Obviously you may not love everything you receive in the box however I made my friend very happy by giving her the Reece's Pieces! I think you definitely get your money's worth with this box as it really is packed with yummy treats and is perfect for someone like me, with a massively sweet tooth!! You can subscribe to the boxes here!